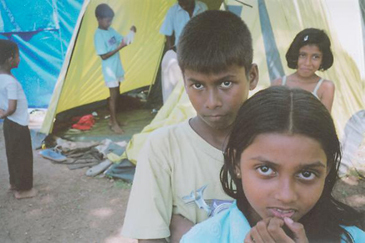 Children in a camp at Telwatta after the tsunami. Telewatta is a small community on the South West coast of Sri Lanka. The destruction caused by the tsunami of 26 December 2004 in Telwatta is regarded as being amongst the worst in the region. Half of the adults lost the means of earning an income, most lost their homes and the psychological impact of the tsunami means life for the village has never been harder. This is especially true for the community’s 300 children who were desperate to resume school and start reliving their lives. In spring 2005, Shining Life Children’s Trust started working with the community to identify how we can work with them to help build a brighter future. In a series of workshops each member of the community helped to decide what was needed. 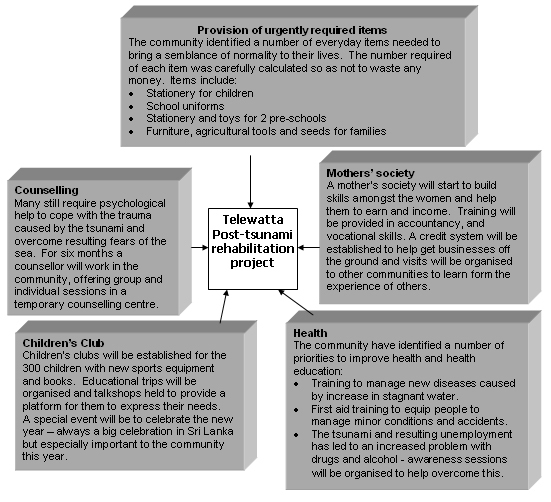 The result is a unique mix of direct aid and longer-term development that touches every part of the community’s lives (see below). All community members left these meetings sure that the plans will mean that, after three years, they would be in a stronger position than they ever have been. To ensure that the development achieved is sustainable, Shining Life Children’s Trust worked in partnership with a local organisation to deliver the project. The organisation was the Humam Development Foundation – its second project with the organisation. In September 2005, the project officially started. There were five interrelated components to the project, as shown in the diagram.